We source Reishi Mushroom from two places. We use organically grown log cultivated Reishi from a grower-guided outdoor laboratory in the Pacific Northwest USA and we also source from the northern foothills of China which is the only place that the type species Reishi (ganoderma lucidum) grows wild and far-away from polluting sources. Log cultivated Reishi's main benefit is that all parts of the mushroom can be harvested for a high concentration of active constituents; especially the polysaccharides. It also produces a consistent supplement that will easily work without any natural variances that could impair potency. Wild Reishi must be harvested sustainably, so only the fruiting body and its spores may be harvested wild. Wild food sources are higher in rare-earth elements. This formulation uses low alcohol, 25% by volume, so that it may be taken everyday and is high in the sweet tasting polysaccharides. See our homepage for more about our methods. 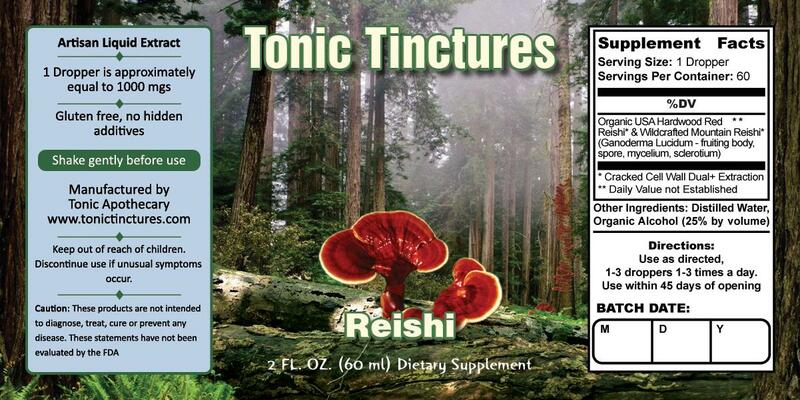 Reishi Mushroom Tincture is 1000mgs extract per 1ml dropper. I've been getting my power pack and other stuff from Jason for years. Service is stellar and shipments always on time. Not to mention the product is explsinedvthoroughly and always achieves amazing results. Tinctures by this company are way stronger. I take this as my daily detox and to help me sleep better. I think I am sensitive, because after talking to the owners, I found that I had to eat when taking it. Thanks for help. A great daily tonic for managing stress and maintaining immune health. Tastes great too. Highly recommended. I was having trouble sleeping and saw that they carried this, so I asked Jason if I could take this with my deer antler velvet and he said I could, but I was skeptical, because I've bought pouches of powders and never really felt it, so I didn't think it was going to work. But I took it right away when it came and it worked super fast. I think its the alcohol and good process they use, probably even because its fresh, it was a totally different experience. After trying this liquid I now understand that powders arn't worth it. Tinctures are very good quality. I don't need more than 1 dropper at a time to make it work.